With her profound love of nature and the botanical world, Elsa Schiaparelli illuminated her salons of Place Vendôme with stars, cosmos, floral compositions and bouquets like a leitmotif, long before the days of the Surrealists. As Elsa said herself “To have a face covered in flowers, like a heavenly garden, would indeed be a wonderful thing!” (Shocking Life, 1954) Leonor Fini would later design this imaginary face for the Shocking perfume bottle. Ursa Major would become Ela’s lucky charm, immortalised as a brooch Schlumberger created specially for her and which she wore like a talisman. With Elsa, flowers transformed into stars and stars turned flowers, sprinkling the cosmic labyrinth that were her salons with asteroids and fragrant petals. This micro big-bang, born from her wonderful childhood memories, forms the gravitating force around which SS19 is born, an astrological collection infused with horoscope signs, stars, the moon and the sun, collisions of fleeting comets, and interstellar elements blossoming out of the dark night sky. For day, ultra feminine peplum suits are defined by a sculpted silhouette, embroidered with scattered porcelain buds, pastel coloured gauze, floral guipure lace, mother-of-pearl and gold, as if playing blind man’s bluff in a cabinet of Meissen, Sèvres or Wedgwood porcelain. Jackets are jet black, embellished with illustrations of zodiacs and comets like a summer’s night, as if elevating the wearer into a galactic Garden of Eden. 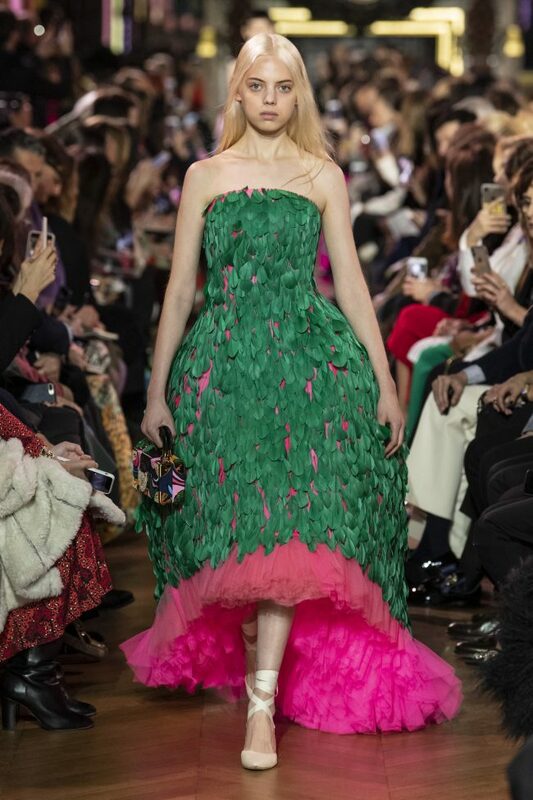 Strange graphic prints extend like branches onto silk gingham, flecked taffeta and double crepe. a witty and playful portrait of women reminiscent of Cecil Beaton or Madame Yevonde portraits. Nocturnal goddesses, like Hesperides dancing in the night, waltz as if attending a summer ball on the Milky Way, which can be found embroidered onto the tulle of their dresses. They wear black pleated velvet and night satin crepe, as well as chiffon illuminated with gold sequins or streams of lunar organza. Cellarius’ Harmonia Macrocosmica fuses with the shocking pink tulle of a round coat, its shape like the corolla of a flower. 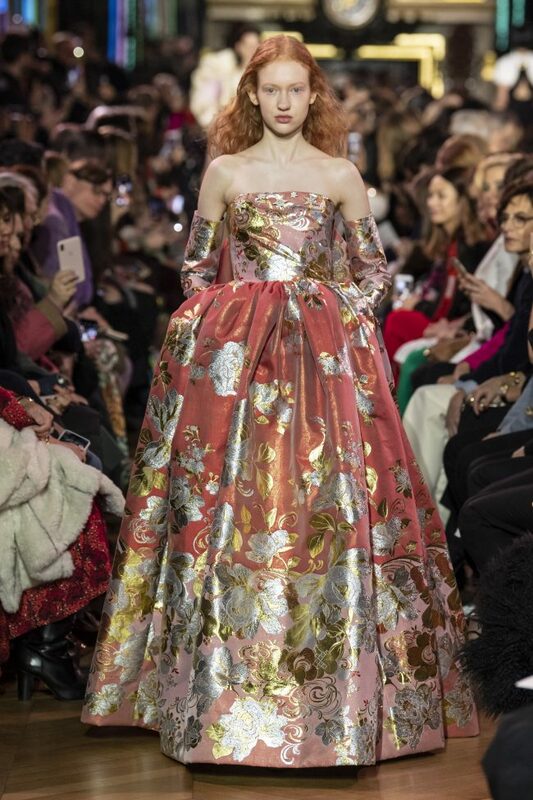 The print also adorns a dress covered in rose petals, and a ruffle dress in forget-me-not gauze or gold powder lampas crinoline. A rhinestone padlock guards the “Secret” kept in evening clutches and vanity cases, the precious stones like meteors in a springtime fireworks display, illuminating the night with its extravagance.